If you were asked to name the most substantial purchase that you have ever made in your lifetime, the answer would almost assuredly be your home; you were likely quite particular about the home you chose, with your decision defined by the purchase price, the location, and the perhaps amount of time needed before you would be able to pay off the mortgage. Viewed another way; you made a major financial commitment, with a long-term outlook in terms of return on investment. So why would this mindset not be the case when it comes to buying furniture for the home? Is it because furniture might simply be considered a commodity? Yes, homes need furniture in their living rooms, dining areas, and bedrooms, but this does not mean that you have to settle for pieces or sets that solve these basic needs yet satisfy neither your tastes nor the rooms where they will be placed in your home. All too often, unfortunately, this is precisely what happens when people buy furniture that is pre-fabricated, mass-produced, or ready-to-assemble. There can be an inclination to spend on pieces that ‘are good enough’ or ‘will do the job’ when in actual fact, something more comfortable, more functional, more size-appropriate, or more aligned with the home’s décor would have been preferred. If this is an apt depiction of the furniture that you have versus what you wanted, then this could be the right time to consider the advantages of investing in unique, custom furniture designs by our skilled artisans at the Carrocel furniture store. When you call on our professionals to create custom living room furniture, a custom dining table and chairs, or custom accent pieces or tables, you are making a long-term investment in your comfort, in the décor of your Toronto home, and in your overall lifestyle. And while custom furniture designs require a greater outlay of cash up front, they offer many benefits over serviceable pieces that essentially deliver short-term solutions only. Our Carrocel team understands the value and importance of creating and constructing the ideal furniture to enrich the décor of your home as well as the comfort and lifestyle of your family. Whether you want a single piece of custom furniture or an entire room makeover, a decision to consult with our designers and artisans would indeed be a path worth pursuing. 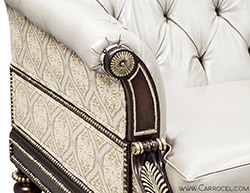 Purchasing custom furniture requires a good amount of discussion and time to achieve just the right designs for your home and décor; and for more than 30 years, Carrocel’s artisans have applied their skills and creativity in this fashion to enhance the homes and lifestyles of area residents. 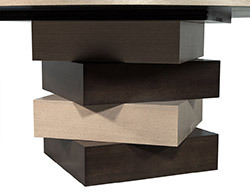 Whether you are thinking of custom living room furniture, a custom dining table, or the perfect accent tables for your Toronto home, consulting with our capable and knowledgeable team can help to inspire new ideas and/or bring existing ideas to life. And where better to do this than a visit to our 20,000 square-foot showroom on Bridgeland Avenue near Yorkdale Mall. Here, you can browse our striking inventory of custom furniture designs curated from North America and Europe, unique one-of-a-kind furniture that may be a perfect fit for your home and needs or that can stimulate ideas for your own creations. For a preview of the many exclusive pieces currently on display in our showroom, please go to our Product Catalogue page and enter the word custom in the product search field. Investing in custom furniture designs can enhance your personal comfort, your home décor, and your lifestyle. 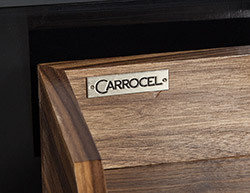 Call the custom furniture professionals from Carrocel at 416-999-2525 today or contact us to schedule a complimentary consultation at your convenience in our 20,000 square-foot showroom at 245 Bridgeland Avenue in central Toronto.